Like many people, Patrick Gabridge and his wife, Tracy, fantasized about one day owning a small farm. They are well on their way to making that dream a reality. Patrick, a playwright and novelist, graduated from the Farm Business Planning Class in 2012 and has been on the incubator field in Dracut for the last two seasons. 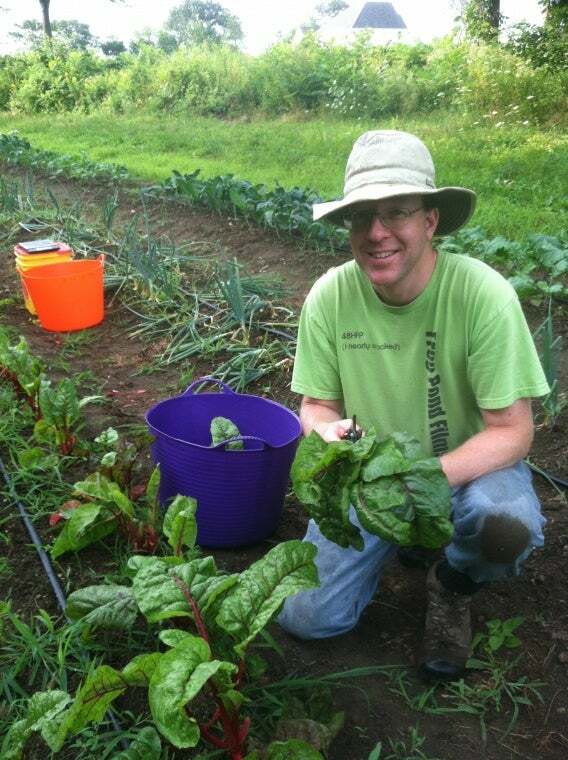 He and Tracy, a librarian, have always been avid gardeners; they started the 200 Foot Garden in Brookline, which turned unused urban space into a public vegetable garden and community building project. As a writer, Patrick has had to learn to overcome fear of failure, which has helped him in pursuing his dream of farming. New Entry was a great opportunity for him to try farming and get a hands-on learning experience. He likes that he is able to be his own boss and has the ability to sell to a wide range of markets. He sells a variety of vegetables to the World PEAS Food Hub and a farmer’s market in Jamaica Plain. In his first year, Patrick quickly learned the differences between gardening and farming. He says farming is more of an intellectual challenge, which he likes, and that a farm requires much more management than a garden. He likened the farm to a large puzzle that requires constant thought, such as knowing what yields to expect, how much to plant, and what needs to be weeded, or which pest is getting to his crops. Patrick has also invested a good amount of time fine tuning his record keeping systems so he can make informed decisions when it comes to which types, varieties, and quantities of crops to plant each season. One thing Patrick loves about farming is growing a variety of crops. He grows what he likes to eat, because at the end of the day he and his family are eating the leftovers for dinner. He grows swiss chard, kale, beets, heirloom tomatoes, tomatillos, and hot peppers for World PEAS. In addition, he is growing a handful of other crops to sell at the market. Despite the challenges of farming, he likes being outside, working with his hands, and the having the sense of accomplishment farming provides. Be sure to check out Patrick and Tracy’s website.